A recovering alcoholic has her quiet cabin retreat turned upside-down by two escaped convicts and the threat of a werewolf in the woods. While escaped convict Rhett prepares to attack a female victim, a werewolf suddenly emerges from the woods to bite Rhett and kill the woman. Recovering alcoholic Emma leaves Boston to return to her small hometown of Foothill, Arkansas after being away for 20 years. Emma moves into a remote country home rented to her by her father’s old friend Wayne Dobbs. Emma meets Wayne’s nephew Johnny Lee. Wayne later warns Emma that Johnny Lee is one of two escaped convicts. Wayne gives Emma a handgun for protection. Despite Wayne’s warning, Emma takes a romantic interest in Johnny Lee. Johnny Lee is attacked by a werewolf. Emma is forced to kick Wayne out of the house when he has too much to drink at dinner and begins making aggressive sexual advances. Shaken by her encounter with Wayne, Emma goes to see Johnny Lee and finds him near death from the werewolf attack. She helps nurse Johnny Lee’s wounds and the two continue their romance. Johnny Lee eventually transforms into a werewolf and attacks Emma. The attack causes Emma to start drinking again. After getting drunk at a local bar, Wayne decides to return to the house to apologize to Emma. He encounters Johnny Lee on the porch and shoots him after a confrontation. When Emma comes outside to investigate, Wayne shoots her, too. Johnny Lee begins transforming into a werewolf and Wayne shoots him again. Rhett arrives and Wayne shoots him as well. While Wayne is distracted by a wounded Emma, Rhett transforms into a werewolf and kills Wayne. Emma flees into the woods. Emma finds a woman named Beatrix in the forest, waiting to offer herself willingly to Rhett, with whom she corresponded while he was incarcerated. Rhett arrives and attacks Beatrix. He then attacks Emma and transforms her into a lycanthrope. In an epilogue, Emma is seen crawling to a nearby residence where she transforms and attacks a woman who answers the door. Emma is a recovering alcoholic whose quest for a change of pace finds her returning to the remote woodland town where she grew up, but hasn’t revisited in 20 years. Helping Emma settle in is her father’s old friend Wayne, who rents Emma a country cottage where peace, quiet, and solitude offer an ideal setting for forging a path towards sobriety. Some movies would offer an introduction like this through character interactions, montages, or maybe a flashback sequence or two running underneath the opening credits. “Werewolf Rising” instead provides all of the above in the form of a narrative exposition dump when Emma leaves an autobiographical recounting of her life on an unidentified friend’s voicemail. Acting as Emma’s bad boy love interest is Johnny Lee, Wayne’s nephew and an escaped convict so dangerous that Wayne gives Emma a handgun for protection from him. Emma ignores Wayne’s warnings and carries on with the man anyway. Meanwhile, Johnny Lee has a complicated relationship of his own with Rhett, a misogynistic murderer who was Johnny Lee’s partner in scaling those penitentiary walls. This would normally be the paragraph where a plot synopsis would fit. The thing is, “Werewolf Rising” doesn’t actually have a story to summarize. The script has characters capable of being loosely described, e.g. twelve-stepping protagonist, serial killing antagonist, sexually inappropriate father figure, and wrong side of the tracks love interest. What the script does not have is a progressive arc for anyone to go on, a reason for backstories to connect, or a clearly defined purpose in mind regarding what anyone is doing or why. Emma reads a book on her couch. Johnny Lee rolls his shirt into a pillow and climbs into his sleeping bag. When Wayne says goodbye following a visit with Emma, the camera shows the entire sequence of Wayne stepping off the porch, getting into his truck, firing up an enormous cloud of exhaust fumes, and slowly pulling off the property. Really, the most accurate way to describe “Werewolf Rising” is simply, characters sort of moving around, not really doing anything, and then a werewolf attacks. Thirteen lines of dialogue and the only piece of information provided is an explanation to Wayne about why Johnny Lee is standing on his porch. One could complain that this is the type of scene that does nothing to advance the story, except there is no story to advance anyway. The acting quality needle bounces all over the spectrum. Bill Oberst Jr. is always reliable, but his screen time here is too brief to have a true chance at registering. Melissa Carnell embodies a pleasant girl-next-door mix of Samantha Mathis and Rachelle Lefevre, but director BC Furtney doesn’t play to her strengths or mask her weaknesses. Carnell has an overly cheery vibe that isn’t right for some of her scenes, and synching her personality to what the moment calls for is a duty of the director. Brian Berry is so rough as Uncle Wayne that I assumed his presence was the result of a favor for a friend. Berry has nine other acting credits to his name on IMDB, eight of which are videos made by the same two people and have user ratings as low as 2.7. 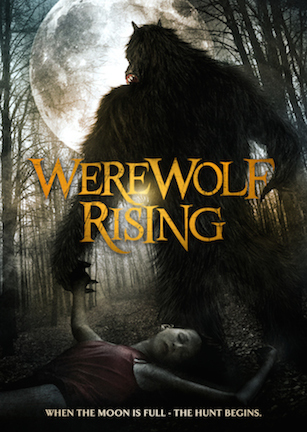 If the werewolf action was even mildly intense, frightening, or exciting, “Werewolf Rising” could scrape up some appeal to lycanthrope enthusiasts looking for full moon fun. Alas, this movie’s beast only shows up sporadically. Aside from colored lenses and open mouths, there is just one brief transformation to speak of. Even then, the full-bodied wolfman looks like a knockoff Chewbacca costume purchased at the Halloween store and augmented with a rubbery prosthetic face. Underdone movies can be partially forgiven for mediocrity when there is some indication of spirited effort behind the scenes or a sincere intent is visible even though it may not have manifested. With “Werewolf Rising,” it is as hard to discern the offcamera motivations for making the movie as it is to figure out what the characters are meant to be doing onscreen. Composer Trevor Pinto fills the audio space with a poor man’s version of secondary “Halloween” themes. One recurring leitmotif intended to amplify tension is literally just one single piano key tapped repeatedly: dun-dun-dun-dun-dun-dun… There’s a random overhead shot of Emma and Wayne riding an ATV, but it is an example of elements that don’t add up. What’s the added production value of rigging one isolated overhead camera crane for a two-three second shot? Visuals, music, and characters. There is never a sense that anything’s purpose was fully thought through or that the effort was fully committed. With such aimless goals at both the production and creative ends, it’s little wonder that “Werewolf Rising” doesn’t deliver. October 14, 2014 by Ian Sedensky.